I am so sorry for being MIA physically from this blog and mentally lately. My insanely busy streak has come to an end, so I now have more time to dedicate to blogging! We were very lucky at our last Beauty Bloggers of Central Florida meetup to have many amazing sponsors. One of our sponsors was Chick Nail Polish. I had heard about this brand before, but never tried them. My first experience with them was a good one! 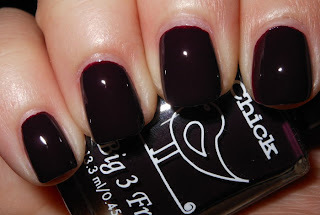 Hen House is a deep vampy plum creme. This a great vampy shade. It's about this time of year, that I've already filled my summer polish quota (yes, I realize it's only the beginning of June), and I'm craving deeper shades. I always get tired of a season's color before it even starts! The formula on this was like butter. It was smooth and easy to apply. Also, while looking at the Chick Nail Polish website I noticed that all of their polishes have cute bird themed names. I can't resist a cute theme! This looks stunning on you!! LOL @ finishing your summer polish quota! Lovely color! I've tried two of this brand and I love them. And the bottle is just too cute! I love their packaging - such a sucker for cute packaging.